South and North Korea agreed on Wednesday to launch a pilot program within this year to exchange information on contagious diseases as they move to expand cooperation in the health sector. The agreement was made during a meeting between South Korea’s Vice Health Minister Kwon Deok-cheol and his North Korean counterpart, Pak Myong-su, and other ranking officials at the joint liaison office in the North’s border town of Kaesong. They were the first inter-Korean talks related to health issues in 11 years. 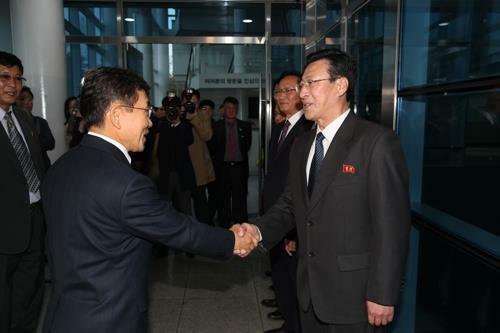 The two Koreas previously held similar talks in December 2007. The two sides also agreed to push forward various projects for the diagnosis and prevention of potentially fatal diseases such as tuberculosis and malaria. The two Koreas will actively seek other comprehensive projects in the health sector and will routinely cooperate through the liaison office, officials here said. “We have agreed to establish a joint response system on contagious diseases and start the pilot program within this year,” Kwon said during a briefing after the meeting. For the pilot program, health officials of the two Koreas will discuss ways to start technology cooperation and people-to-people exchanges, Kwon said. While North Korea is under international sanctions, the health ministry will consult with the related organizations to see whether it can provide medical assistance for humanitarian purposes.